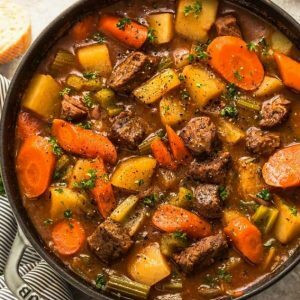 Instant Pot Beef Stew is such a comforting dish on a cold day. This easy pressure cooker recipe is full of tender meat with carrots, potatoes, sweet potatoes & celery. 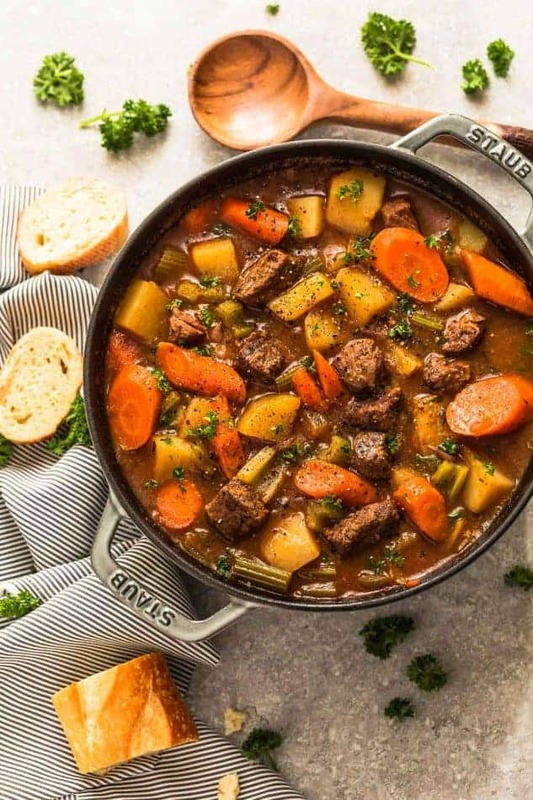 Classic beef stew is still one of my favorite lazy Sunday meals I make for my own family now and they love it just as much as we did. And now that I have an Instant Pot, I could not wait to try making my some classics like oatmeal, rice, pasta, chicken, hard boiled eggs, soup and of course, this Instant Pot Beef Stew in it. And you know what? 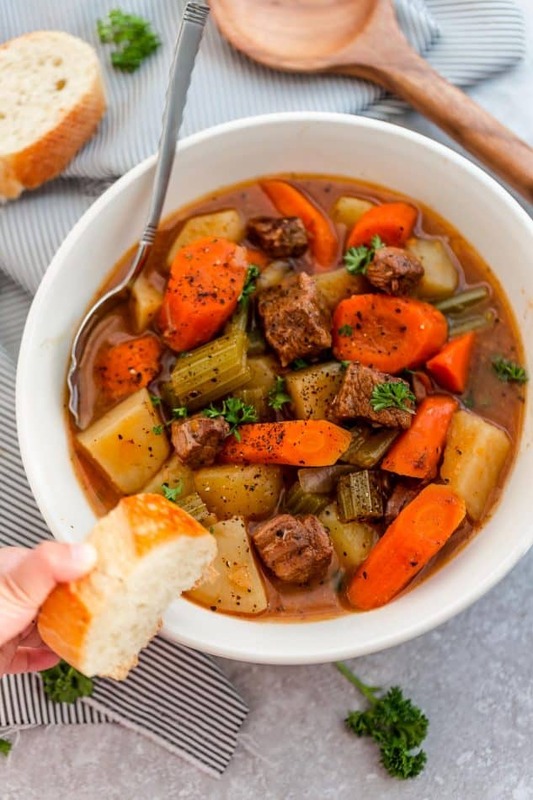 Instant Pot Beef Stew was an instant hit with my family and is now another big time reader favorite along with my other three versions above. Start off by combining flour, salt, pepper, onion powder, and 1/2 teaspoon Italian seasoning. Add meat and shake until well coated. BROWNING THE MEAT:(FEEL FREE TO SKIP THIS STEP IN A PINCH BUT HIGHLY RECOMMENDED SINCE IT ADDS THAT EXTRA LAYER OF FLAVOR) – Set the Instant Pot to SAUTE, add cooking oil and brown the meat on all sides. Meat will not be cooked through. (Be sure not to crowd the pot – you may have to work in batches). Transfer browned meat onto a large plate. Add the beef back into the pot along with potatoes, sweet potato, carrots, celery, Worcestershire sauce, the remaining 2 teaspoons Italian seasoning, bay leaf, beef broth and (star anise if using). Stir to combine. If there is not enough liquid to cover the vegetables, add water – only as much as needed. 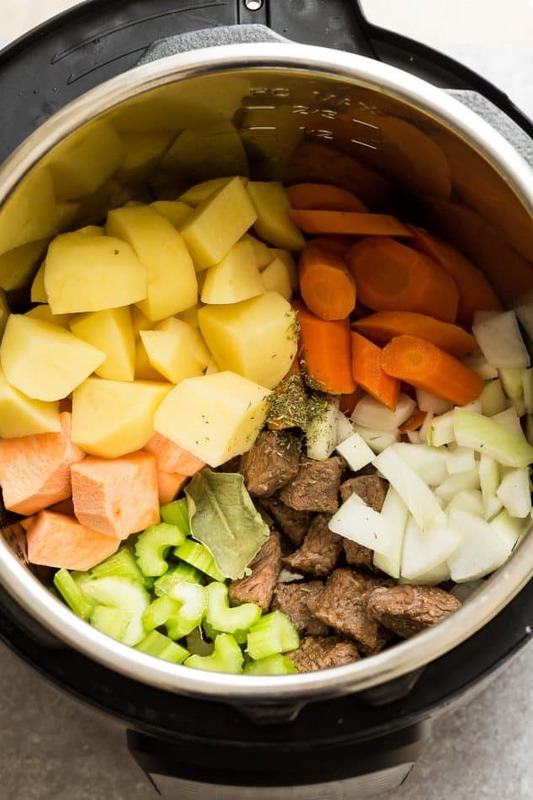 What is the best pressure cooker for making beef stew? Be sure to use at least a 6 quart Instant Pot pressure cooker for this recipe. 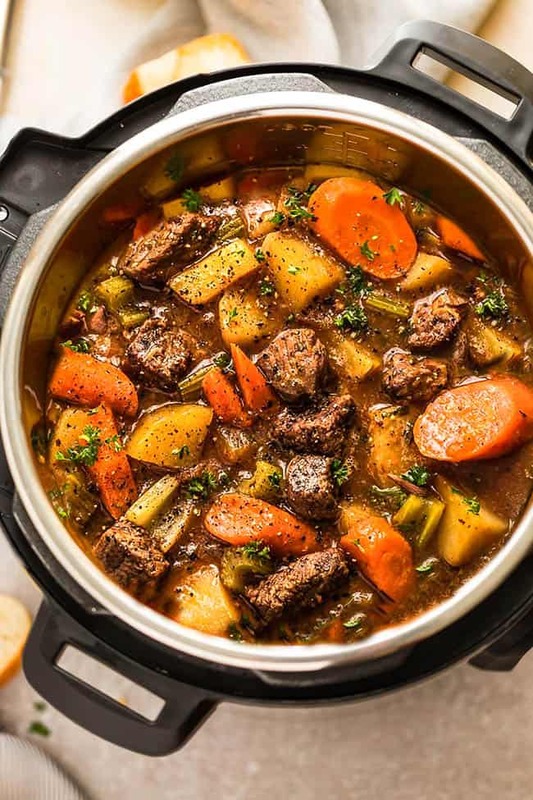 This Instant Pot Beef Stew recipe makes a big batch with enough for lots of leftovers. In fact, I think I love the flavors even more the next day. All those thick rich and deep flavors get a chance to build even more overnight. Watch the video and see how easy this stovetop version is to make. Hi Sherry, the 3 quart might be too small – if you do use a 3 quart, you may have to scale down the water and vegetables. I don’t see a “manual” button. Also, “allow the pressure cooker to release naturally for at least 15 minutes.” During cooking? After it’s cooked? 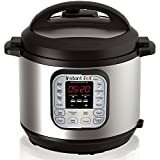 I’ve just taken my Instant Pot out of the box, using it for the first time. Wow, I appreciate the quick response, Kelly! I decided to wing it used “Pressure Cook.” The result was awesome and I now feel Much more at ease with the IP. Many Thanks! I found that reading the manual and doing the test run were very helpful. Deliciious!!! 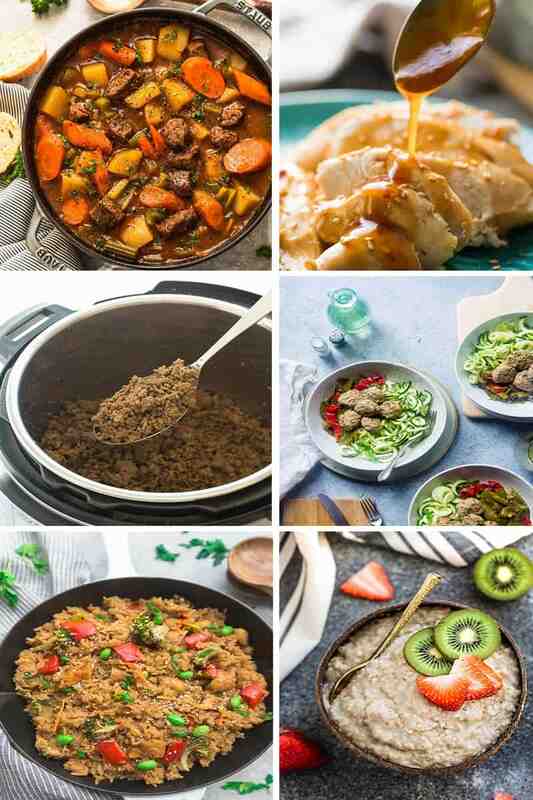 I have only had the instant pot for a couple of weeks and am still learning. 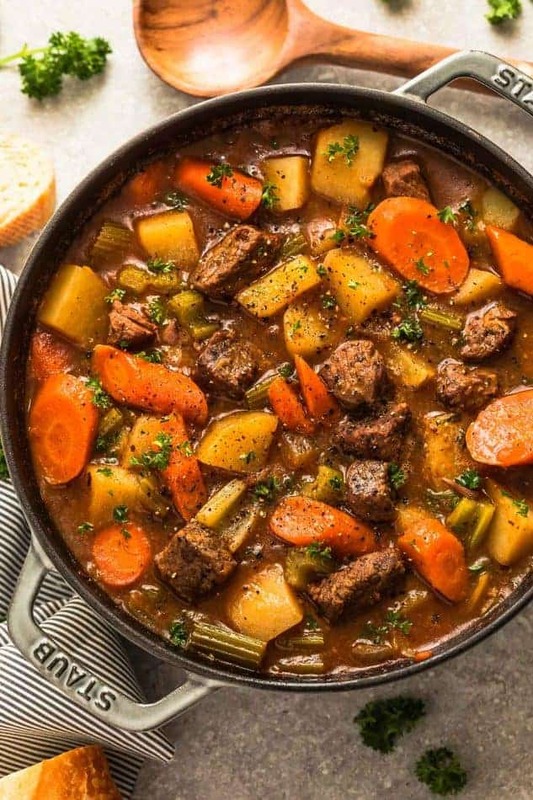 I made this recipe last night and my husband said it was the best beef stew he had ever had. We are eating leftovers again tonight with some gluten free coconut flour bisquits. Left potatoes out of f the recipe since I didn’t have any on hand. Thanks for a great recipe!!! Hi Tracy, so happy to hear that! The gluten free biscuits sound amazing! Enjoy! Hi! I made this last night and it was amazing!! My husband went back for seconds and that is his highest praise lol. I came back to your post to jot it down and something is wrong in the ingredient list after celery. That isn’t how it looked last night. Can you fix it please?? This will be in my recipe rotation. Thank you!! Hi Claire, so happy to hear that! Thanks so much for coming back to let me know. Sorry about that, it’s my new recipe plugin – I had my tech people look into it and hopefully it’s fixed now. Enjoy! Thoroughly enjoyed this recipe. Definitely did the cornstarch and water thickening technique. Even sub-ed in a parsnip instead of the sweet potato, delicious! Hi! My store didn’t have the anise star, only seed. Can I substitute? Hi Yes, you should be able to use 1/2 – 1 tablespoon of aniseed. Hope that helps! Excellent recipe. I used 1T. anise seed that I had in the pantry and wow!!! Secret ingredient. Delicious! Hi Kim, so happy to hear that, thanks so much for stopping by and letting me know! Have a wonderful rest of the evening! Sounds delicious and I plan on making this soon. I have a question, we do not eat potatoes have you ever made it without them and do I need to adjust the liquids? I notice the recipe calls for 1/2 t of Italian seasoning but towards the bottom it calls for 2t of Italian seasoning. Just seeking some clarification. Is it 1/2t to mix with the meat in step one and then an additional 2t in step 4 when you add the veggies? Hi Allie, sorry about the confusion. You add Italian seasoning in twice – once with the beef and then again with the stew – I just revised the recipe and hopefully it helps. Thanks. Did the carrots get done? I like them very done. Hi Susdie, yes, the carrots get cooked – if you like them softer, you can continue to cook the stew longer on the Saute mode after the stew comes to pressure. I have made this twice and it is delicious. A big hit with my family. Thank you! I made this two nights ago and it is delicious!! I used round steak, and it was SO tender after cooking. Even better as leftovers too! This will become a regular in our house now! This recipe is absolutely delicious! Just a quick note that the time saving prep hints of chopping vegetables day before and keeping them in frig (celery and carrots) and freezer (onions and potatoes) adds just as much cooking time as you would have spent prepping because frozen vegetables take a long times to come to temp and pressure. So you save hands on time but not actual time to finished dish. So know that in your timetable to getting dinner on the table. But let me reiterate, this will probably be the best beef stew you’ve ever had. Brown the meat and use star anise! So good!! I just made it and added the sweet potatoes too. Absolutely delicious!! Any idea the nutritional value? Calories, sugars, sodium, calories from fat, carbohydrates? Made this for the second time and my husband and son loved it! Best beef stew recipe i have ever made. Thank you for sharing. made this recipe over the weekend. It was very tasty, especially with a piece of Italian bread to dip in the juice. The only ingredient I left out was the Anise star since I didn’t have any. My husband loved it. Thank you for the recipe! It is the best beef stew i’ve ever had! Follwed the INSTRUCTIONS as you indicated and it was perfect! I have made this 3 times now and just love it! I Make it a little More on the Paleo side and swap the potatoes for more meggies or other root vegetAbLes. I Prefer the flavor of red wine Vs BalsamIc. I also add a little more seasoning thaN what it calls for. Tip-if you dOnt want to wait for the pressure to release natUrally, i cooked mine on high pressure for 28 minUtes vs the 20 it says. I let it release for about 10 mInutes and then manually released the Pressure. This is helpful if you are short on time. COmes out perfectly cooked! Hi, the recipe was great, really flavorful as promised. The stew was delicious. I’ll definitely make this again. OUR NEW FAVORITE STEW! THANK YOU!